This is an activity that we have used with” House and Home” language learning and also when we practise setting the table with cutlery and crockery and pretend to be” à table” in a French Christmas sketch with Year 6. This year I think it sits really well with UKS2 a celebration of your French/ Spanish/ German picnics or café culture focus during Summer term. You can develop some Art and DT work from this language activity too. German :This will work in all three languages as described, however if you are working with German you may need to use the command “Put” with key accusative prepositions first introducing the concept using feminine and neuter nouns. I would then introduce and share how the sound and spelling of the masculine definite article (der) has been altered when using these prepositions. Let your children be the language detectives and solve the sound and spelling riddle here. You can then continue with prepositions that are either accusative/dative or purely dative as and when you feel the children are ready to strengthen their language detective skills. Here are my picnic items. They are nearly all red in colour- but you could have different colours so that the children had to add a colour to the noun too to increase the challenge. When we worked on this in class all the children had access to a plastic spoon, fork, knife, plate, cup and beaker. There was one between two of everything and I just bought cheap packs from a local supermarket. Revisit and recap the items of crockery and cutlery for your picnic and reinforce the correct definite article with each noun etc). Do the children know that it’s “la tasse” for example. Using physical actions with the children create preposition warm up. The children need to move their hands and arms to represent the position of prepositions e.g. Bring the class to the front or to an area where you can lay out your picnic mat. 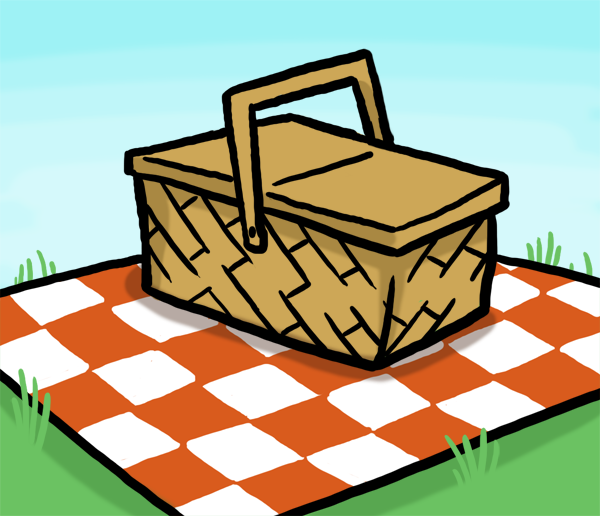 Demonstrate setting the picnic mat for the class with your items. Demonstrate how the table should be laid and place the crockery and cutlery correctly, saying clearly on the target language as you move and place items “put the cup above the plate, put the knife next to the plate on the right” etc..
Muddle up the items and ask children to place the items for you – giving the children clear target language instructions . Now ask the children to help you reset the table in a new and creative way. The children can direct you to place the items where they wish e.g. put the knife in the cup , put the spoon under the plate etc. Give each group a set of written instructions. Each set of instructions uses the same crockery and cutlery but the table will be set slightly differently- no table should be set like your modelled table in the previous activity . Ask the groups to read the instructions and lay their tables. Now take a class tour of the tables. Can the children spot the differences between the table they are looking at and your original table? Can the children work in pairs and direct each other to set their tables – firstly correctly and then creatively? Can the children create a 3D sculpture of the crockery and cutlery piling it high rather than placing it flatly on the picnic table or mat? The outcome of this activity is that the child creates a 2D or 3D piece of art placing the crockery and cutlery in a design pr sculpture about which they write a set of instructions so that someone else could do the same. They will use their command “put” and a variety of prepositions to do this. There is a choice here of delivery styles: an ICT photo story , a poster, a spoken demonstration to recreate their art work to their group, or a sculpture or painting of their work which is framed by their target language instructions around the outside.